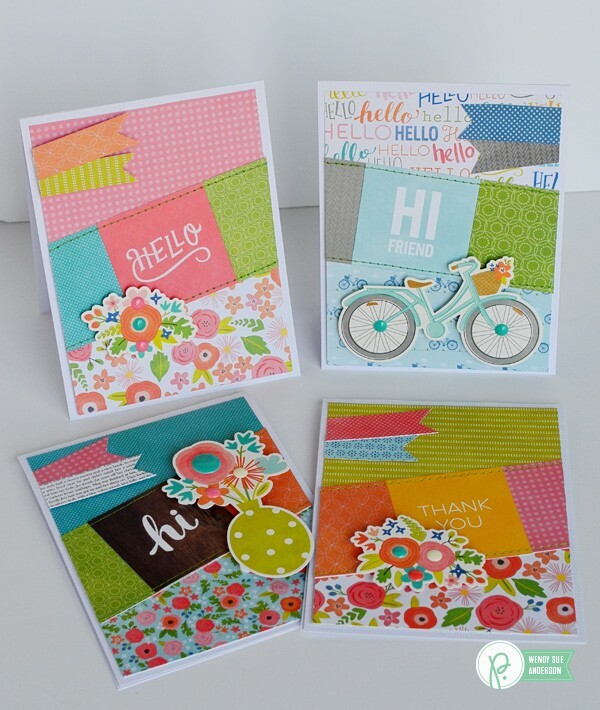 "Happy Day" Card Set - Pebbles, Inc.
Start by cutting a 2″ square phrase from the patterned paper, and cut two 2″ strips from papers in the 6×6 pad. layer them together and glue. Next, place the strip on a card front – which was made by layering two additional coordinating papers together to create a 4″ x 5 1/4″ base. This time I placed the strip on an angle, and then trim off the edges. Adding machine stitching is always optional…but I almost always opt for it! I love the look of it, and enjoy the tiny bit of texture. 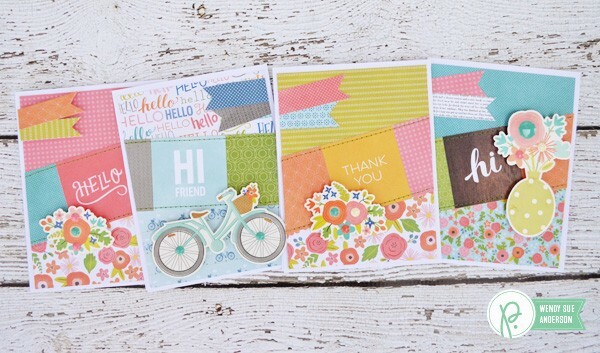 It makes handmade cards feel even more “warm & fuzzy” to me. Now it’s time to place a sticker near the sentiment. I like to add my stickers with foam adhesive. And cut some little banners from strips of paper for the empty space at the top. 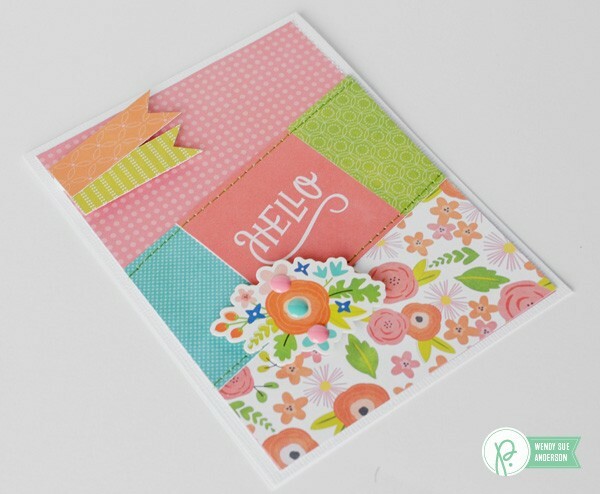 Finally, complete the card by placing the entire piece on a white card base (4 1/4″ x 5 1/2″). And repeat the process for as many cards as you want to create! A set of cards like this, wrapped together and tied with jute, would make a lovely gift as well – I’m thinking teachers might especially appreciate a cute little stack of notecards! 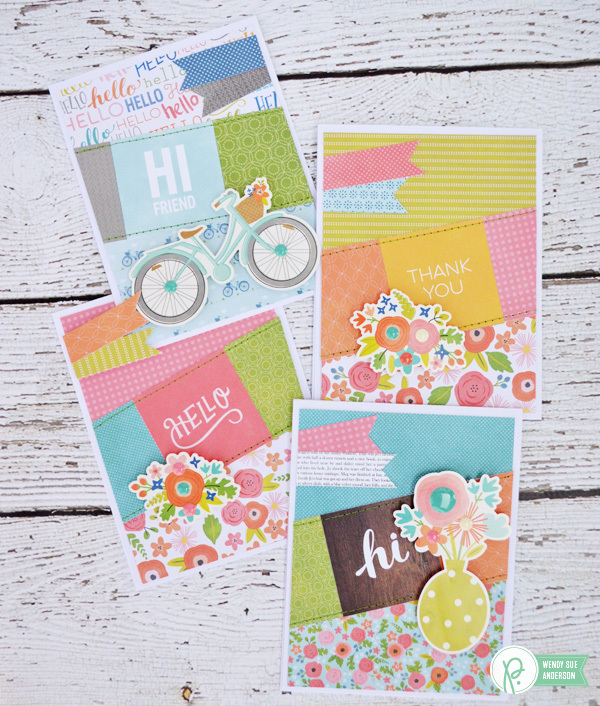 Wow love these cards and thanks for sharing your process.